In the autumn of 1990, Royal Mail embarked on a programme to increase the security of British stamps. This high value stamp include some of these security features. 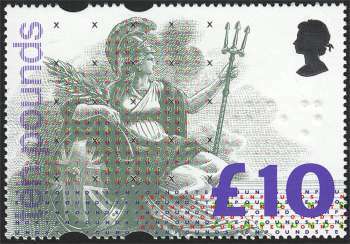 In 1993, Royal Mail issued its one and only £10 definitive - a magnificent, large size stamp featuring Britannia. The paper contains fluorescent coloured fibres which, together with the ink used on the shield, react under UV light. Under a UV lamp the shield and fibres fluoresce yellow. On some printings the words 'TEN POUNDS', printed twice in bright green near the large '£10' value, also fluoresce yellow under the lamp. A colloquial term for paper having coloured cotton, linen, jute or wood fibres embodied within it (in appearance like the 'veins' in granite), the fibres being introduced in the pulp stage of manufacture. It was used for the early stamps of Austria, Switzerland and other Europeans countries, but has also been used for many photogravure stamps of Switzerland and Taiwan in more recent years. A paper of similar character, known as silk paper, was used for US revenue stamps. Occasionally granite paper is referred to as 'silurian paper', mostly when it contains blue fibres and the paper is bluish-grey colour. 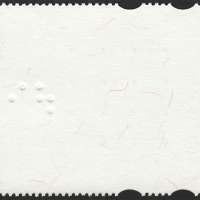 The fibres in granite paper are usually clearly seen on reverse of the stamp, mostly curved and measuing 1-3 mm in length.